Coral have invested heavily in their mobile products and it show in their excellent iOS apps that offer an extensive range of markets, in-play betting, live scores, plus live video of horse and greyhound racing.. The iPhone was the first smartphone and in our opinion it is still the best. Even though Android has a larger market share, iPhone owners gamble more per head. This might explain why bookmakers always give iOS devices higher priority when they're developing a new app. In the early days bookmaker apps were pretty basic, offering a very limited number of functions. If you wanted to do anything more advanced that place a straight bet, you needed to return to their main website. The latest generation of iPhone bookmaker apps now offer live scores, results, news, betting tips, audio commentary and live video streams of both horse racing and sporting events. Live Video Streams & Audio Commentary - Mobile bookmakers stream thousands of sporting events for free every month to their iOS apps. Watch Wimbledon Tennis, NBA basketball, golf tournaments, soccer matches & more. Exclusive Promotions - Most online betting companies realize that mobile is the future so they offer exclusive free bet offers to their mobile customers to entice them to download their iPhone, iPad, Android and Windows Phone apps. Horse Racing Tips - You can now watch live horse races from around the world on your phone. Most apps also offer forms guides and independent betting advice from jockeys and tipster which improve your changes of winning. 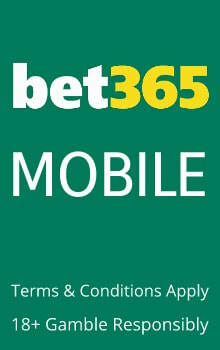 In our opinion Bet365 is the best mobile bookmaker application for the iPhone and iPod Touch. 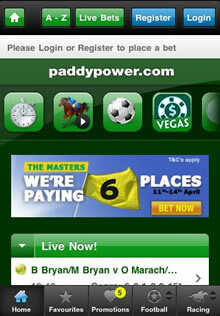 It offers in-play betting, live scores and results, detailed horse racing form and racecards and more. Not only can you watch every U.K. or Irish horse race live on your phone, you can now also watch a wide variety of other sports for free, including football, tennis, rugby, basketball, cricket, boxing, volleyball, squash, snooker, darts and much much more. Boava are a United States friendly sportsbook that are based in Canada. They were known as Bodog until they rebranded as Bovada in 2010. 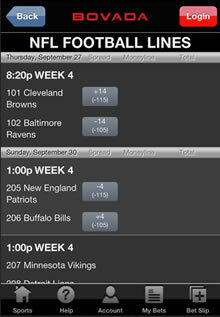 Bovada Mobile is the slickest mobile betting app available today to iPhone sports bettors in the U.S. It offers in play betting and lines on every major sport, with a strong emphasis on U.S. leagues such as the NBA, NFL, MLB, NHL, and UFC/MMA. iPhone users can also place bets on the Kentucky Derby, The Preakness Stakes, Belmont Stakes, Aintree Grand National, The Melbourne Cup, Cheltenham Gold Cup and every major horse race from any smartphone. BONUS: When you make your first deposit with Bovada, you will instantly receive a 50% bonus up to $250. Paddy Power Mobile is used by more sports bettors in the United Kingdom than any other sportsbook app and it's easy to see why. Their app offers live betting on thousands of sporting events, full access to all their money-back specials plus stats, facts and more on your favourite team. Horse racing fans are also well catered for, with horsing racing tips provided by the Racing Post, top jockeys and leading racing tipsters. Paddy Power stream more live racing than any other bookmaker. Watch racing from every racecourse in the U.K., Ireland, Dubai, South America and South Africa on your iPhone or iPad. If you haven't found an answer to your query in this section, please let us know what problem you are having and one of our technical support team will get in contact. I can't find any bookmaker apps in the iTunes App Store? Unfortunately, for legal reasons Apple only include gambling apps in their App Store in a limited number of countries. The good news is that online bookmakers also offer web apps that look the same and offer exactly the same features. To access these apps you just need to browse to their main website form your phone and you will be automatically redirected. You can then bookmaker the app on your homescreen for quick and easy access later. Are there any United States friendly sportsbook apps? Yes. While many of the major European and UK bookmakers do not currently accept bettors from the USA, a growing number of mobile betting sites are opening their doors to USA citizens. We've put together a full list in our U.S. Sports Betting Apps section. Yes. All the apps we feature offer a full cashier service so you can make a deposit or withdraw funds anytime you like. What connection speed is recommended for mobile bookmakers? That depends on what you plan to use it for. For regular browsing and wagering a regular Edge or 3G connection will be more than sufficient. If you plan to watch live broadcasts of horse races or sporting events then we would recommend that you have at least a 3G connection. If you have a 4G/LTE or WiFi connection the picture quality will be probably be better. Is there a difference between iPhone and iPad betting apps? That depends on the bookmaker. A number of companies like PaddyPower and Bet365 have developed iPad apps that are designed specifically to fully utilize the larger screen of both the iPad and iPad Mini. The Apple iPhone - Every Sports Fans Dream! The Apple iPhone is a wonderful device with a stunning number of possible uses, especially thanks to its high internet connectivity. Over the past few year, the massive success of the device has attracted the attention of a huge number of online sports betting companies, resulting in a new wave of mobile bookmakers. Obviously, those apps differ from one another – some require you to make a download, while others are browser based and will allow you to place your wagers without altering the software on your iPhone in any way. What really makes the iPhone sports betting apps so interesting though is the fact that they tend to take full advantage of the impressive capabilities of the device. Basically, the large screen of the iPhone allows you to view bookmaking software the way it was designed – the developers of those apps weren’t forced to take any shortcuts, as everything was already there in terms of hardware. Consequently, while poker, casino and other gambling apps tend to offer extremely limited functionality when compared with their desktop-based counterparts, mobile bookmakers are basically the same thing in a different package. After all, making the right sports predictions doesn’t require you to make any split-second decisions most of the time, so the nature of bookmaking simply circumvents the biggest problems of mobile gaming. Keep in mind that most of the online sports betting companies involved in providing mobile bookmaking services have plenty of experience that comes with being a part of an extremely competitive market for a decade or, in some cases, even more. As a result, these companies adhere to the highest standards when it comes to customer support, security and transparency. In the end, whether you’re betting on soccer, basketball, horseracing or even fantasy football, you can rest assured that your money is 100% safe in their hands and that there will be no problems with getting your winnings back. The number of sports available for you to bet on is rather impressive on most sites and there’s enough to satisfy even the fans of some rather niche sports. The available options include tennis, rugby, cricket, motor racing, auto racing, NBA & NCAA college basketball, American football as well as a number of fighting sports like boxing and even mixed martial arts. Basically, all the sports that make the fans passionate enough to bet their hard-earned money on their favorite teams or contenders are available on most of the major mobile bookmaking sites – so if you’re interested in online sports betting and you have an iPhone, there’s no reason to be glued to your computer screen while placing your wagers. Just like with other, similar mobile devices, the choice of online bookmaking services available for iPhone owners can be confusing at times, especially since plenty of them are going to tempt you with exclusive features like live streaming and live betting options. This site was designed to provide you with comprehensive reviews of the major players in the industry, so if you want to make an informed choice when it comes to selecting the right iPhone sports betting site to suit your needs, you definitely came to the right place.